In Casino Royale, the first of Flemings 007 adventures, a single game of cards is James Bond's only chance to bring down the criminal network of desperate SMERSH agent Le Chiffre. But Bond soon discovers that there is far more at stake than money. Ian Lancaster Fleming was born in London in 1908. His first job was at Reuters news agency after which he worked briefly as a stockbroker before working in Naval Intelligence during the Second World War. 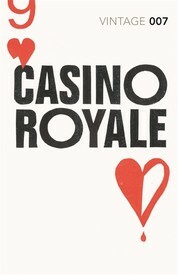 His first novel, Casino Royale, was published in 1953 and was an instant success. Fleming went on to write thirteen other Bond books as well as two works of non-fiction and the childrens classic Chitty Chitty Bang Bang. The Bond books have sold over sixty million copies and earned praise from figures such as Raymond Chandler who called Fleming the most forceful and driving writer of thrillers in England and President Kennedy who named From Russia with Love as one of his favourite books. The books inspired a hugely successful series of film adaptations which began in 1962 with the release of Dr No, starring Sean Connery as 007. Fleming was married to Anne Rothermere with whom he had a son, Caspar. He died in 1964.